I learnt about #JetScreen, the inflight entertainment solution from Jet Airways sometime in October 2016, but had to wait till December to accidentally get a chance to try it. 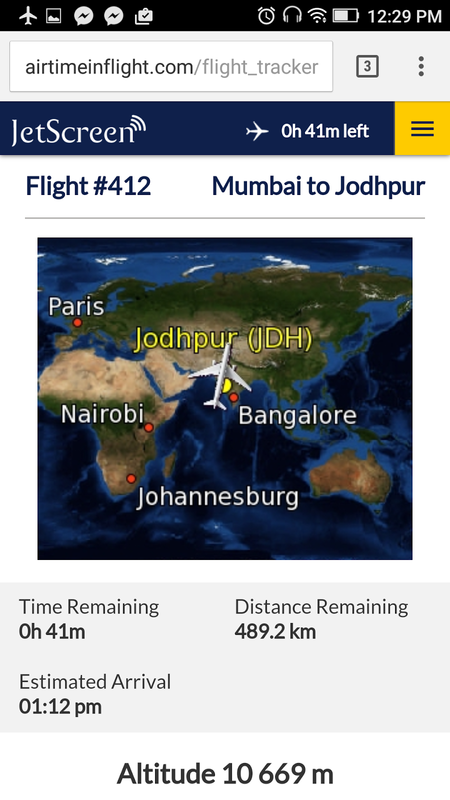 On my way to Bikaner via Mumbai and Jodhpur, I got to try Jetscreen on the Mumbai-Jodhpur leg for about half an hour. This post is a critical review of this service, based on one limited exposure I had. Please note that the facility is being rolled out in a phased manner and some of the drawbacks I have listed are likely to be resolved over time. It is a WiFi based entertainment content streaming service. Instead of conventional entertainment systems that involve a screen attached to the back of the headrest in-front of you, Jetscreen streams entertainment over WiFi right into your smartphone/tablet or laptop- eliminating the need for expensive hardware (mini display screens) and electrical wiring all around the plane. With one streaming device (and may be some WiFi signal boosters), entertainment can be delivered to all interested passengers-almost all of whom would anyway have a smartphone. How is JetScreen different from traditional inflight entertainment systems? Uninterrupted usage is good, but you will miss key announcements- dangerous in case of emergency. Usually most domestic flights in India, even on full service airlines do not have entertainment system. Air India turns off entertainment on domestic leg even if aircraft is equipped with screens behind headrest. In flight entertainment is a Standard feature on most long haul full service international flights. 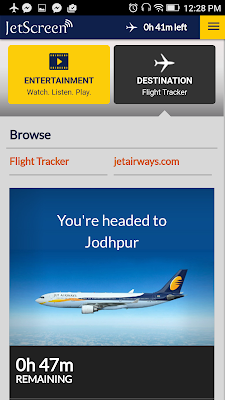 Select domestic flights of Jet Airways have JetScreen now-usually long distance sectors operated by 737, but not all. How would you know if your Jet airways flight has JetScreen? 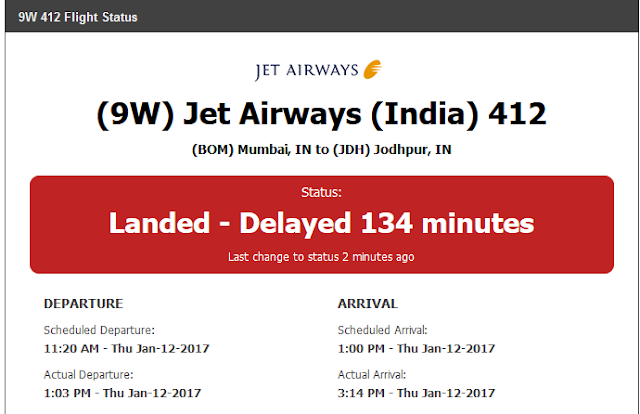 Once I got my ticket, I checked with Jet Airways call centre to check if my flight will have jetscreen- They couldn’t confirm. But the night before departure, I got an email from Jet Airways indicating that my Mumbai-Jodhpur flight is Jetscreen equipped. As I entered the aircraft, I was greeted with a sticker that said the aircraft is JetScreen enabled. 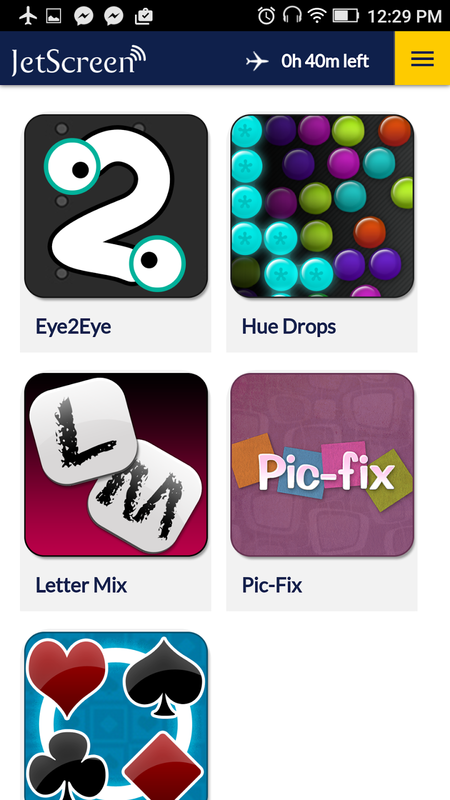 (The first photo of this post) I had the airtime player app installed and thought of trying the JetScreen right away. But it couldn't be located. As I checked with the air hostess (Shreya was her name- I read it from her name badge and called her by name- she was surprised) said it will be turned On after take off. So I went back to JetWings to keep me busy- it takes 15-20 mins approx from the moment you board till the boarding completes, aircraft taxis, takes off, reaches some decent altitude and captain switches off seat belt sign. Conventional IFE systems function usually soon after boarding or at least once doors are closed. What all are there in JetScreen? Some 20 min later, an announcement was made that JetScreen is now available. I could connect to it without any issue. I could chose from flight information, songs. movie/tv shows and games. 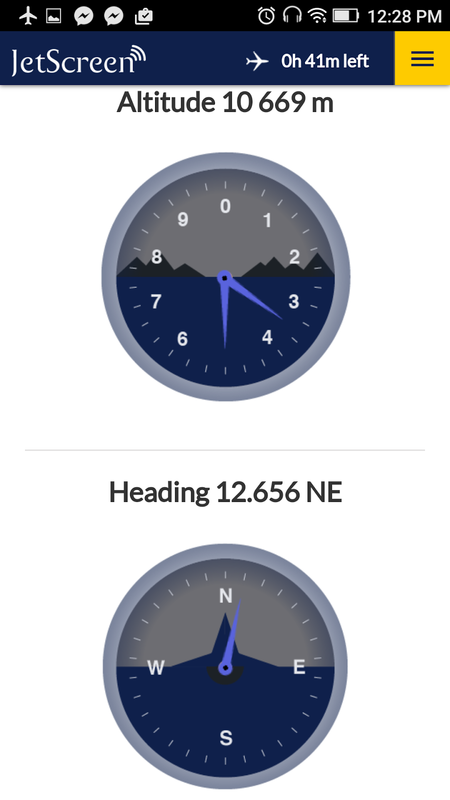 Heading, Altitude and Speed are the 3 vectors extremely critical for aircraft navigation. As a passenger, I can't do much with this information, but it is nevertheless fun to view these info. When you watch aircraft shows (like aircrash investigations on Nat Geo) you can understand a situation much better if you're familiar with these things. Traditional IFE systems pause if there's a cabin announcement in progress and program resumes only after announcement ends. JetScreen system is not connected to cabin announcement setup and doesn't care if there's any announcement. This is usually good- most announcements are routine and boring - such as safety demo, announcement that meals will begin now, you can donate to charity, inflight sale, request to return to seat etc -, we don't need them. But the down-side is that if there's a real emergency- say you're a doctor and cabin crew are asking if there's any doctor among the passengers, or emergency things like that- you will be oblivious to such announcements if you're lost in your Jet-Screen entertainment. I was expecting it to run till we land, but at about 1 PM, Original landing time, Jetscreen turned itself off. In reality we were still in the air and the descent had just begun. Effectively I got just about 30-35 min out of the total gate to gate time of 100 minutes. 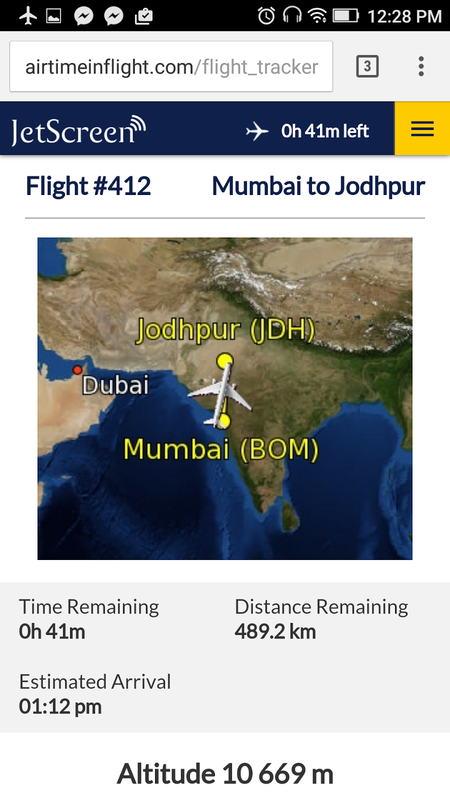 I am not sure what happens if the flight is delayed by say 2 hours- by the time aircraft is airborne it would be landing time as per original schedule, so you can't use Jetscreen at all. I hope there is some control on-board for the staff to reset it or turn it on again in such cases. 1. Something entertainment is better than no entertainment at all, so it is definitely good initiative. There're a few drawbacks, I hope airline will improvise overtime, based on feedback and data. 3. Good marketing strategy, puts pressure on other airline to offer something similar or better. 5. Move convenient to use than traditional In flight entertainment systems. 1) Effective usage is for very short duration - from actual post take off seat belt sign turn off till original landing time, irrespective of delay. Will be great if they can enable it from door close after boarding till door open after landing. I don't know if this WiFi based system affects any aircraft communication/navigation, because of which it can't be offered when plane is on ground. 2) If Take off is delayed, Jet Screen shouldn't be turned off as per original landing time. Is availability should be adjusted for actual flying time that day, that flight. On a 2 hour flight, usually it takes about 20-40 mins depending on airport, congestion etc for the flight to take off and seat belt sign is switched off. Another 20-30 min is needed at destination for descent, taxi etc till aircraft door opens. So effective playtime is about an hour. If there is a delay- it reduces even further. For example today same flight is delayed by 2 hours +. I am not very sure for how long JetScreen was available in this case, if at all. I asked another friend who got to try JetScreen- he also confirmed that it stops as per original time even if there's a delay. Will take some time for this facility to be available across most of the Jet Airways fleet. Till then it is a hit or miss without a sure shot way of knowing if you'll get it on your flight or not at the time of booking. 1) Many international airlines now offer free/charged in-flight Wi-Fi. 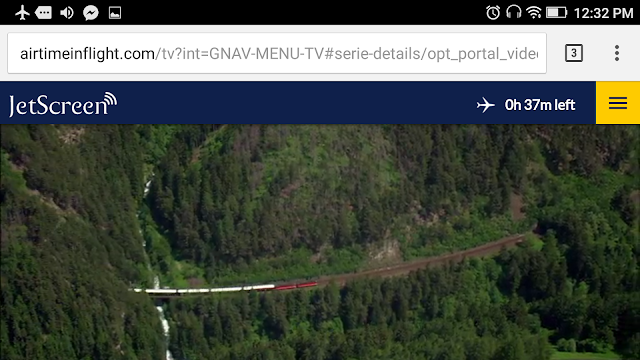 Jet should try to offer the same, along with JetScreen- then the experience will be complete. But I think there's some issue with government regulations that is preventing airlines from providing this service. 2) Having to download Airtime Player prior to boarding makes it tricky. 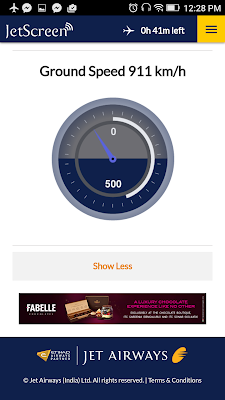 If this can work with any browser/more popular apps then those who forgot to download airtime player also can enjoy. 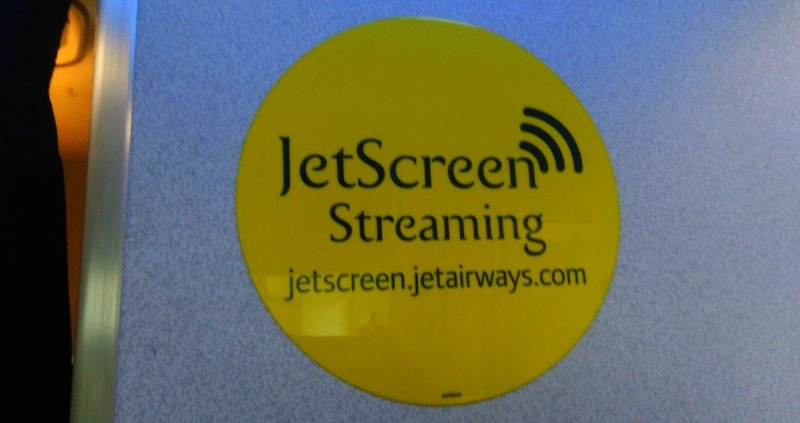 3) Over time, once Jetscreen is available in most of the flights and passengers are aware of it, Jetairways can also consider discontinuing printed version of JetWings and make it accessible online- saving lots of money and going green. Overall it is a great idea and initiative. Wish it was available longer. Purpose of this post is not to criticize JetScreen for its drawbacks, but to help them improve this innovative feature for its maximum potential. Of course it is in its initial phase right now and over time I am sure service will improve on various aspects. I was not invited by JetAirway to try this- I accidentally got it one of my flights and as you see, have ended up doing a complete detailed review. I understand Vistara also has a similar facility (Vistara world) but I have not been fortunate enough to try Vistara till date. seems like a lot of kinks to be ironed out. But on the whole a useful service for long flights. Thanks for the detailed review Shrini! Thanks. Yes, I am sure they will refine it over time. @Divsi- Hope you get to try this- All the best. Thanks for detailed summary of JetScreen. As far as I know, Jet Airways team is working to pause the system for important announcements to be heard,so that drawback will be removed in future most likely.